Republican John McCain on Monday called for greater oversight of the Bush administration's proposed bailout of U.S. financial markets. Meanwhile, Democrat Barack Obama moved to claim the mantle of fiscal responsibility in a roiling economy, vowing on Monday to slash federal spending on contractors by 10 percent and saving $40 billion. Urging members of his own party to be just as fiscally tough as the most conservative Republicans, Obama said the $700 billion economic bailout plan proposed by the Bush administration and congressional leaders is forcing a renewed look at federal spending. As president, Obama said he would create a White House team headed by a chief performance officer to monitor the efficiency of government spending. "I am not a Democrat who believes that we can or should defend every government program just because it's there," Obama said at a rally in Green Bay. "We will fire government managers who aren't getting results, we will cut funding for programs that are wasting your money and we will use technology and lessons from the private sector to improve efficiency across every level of government." "The only way we can do all this without leaving our children with an even larger debt is if Washington starts taking responsibility for every dime that it spends," he said. "Never before in the history of our nation has so much power and money been concentrated in the hands of one person. This arrangement makes me deeply uncomfortable," the presidential candidate said at a rally here. "We will not solve a problem caused by poor oversight with a plan that has no oversight." McCain praised Paulson and said he had spoken to him several times over the weekend. But the GOP presidential hopeful nonetheless called for a bipartisan oversight board to supervise the proposed bailout, to be led by Warren Buffett or another widely respected business leader. Earlier, McCain, who just a week ago said the economy was fundamentally sound, said he believed the U.S. financial system is facing a major crisis. Speaking on NBC's "Today" show, McCain said, "We are in the most serious crisis since World War II." He also said that despite the ballooning national debt he would not raise taxes if elected president. 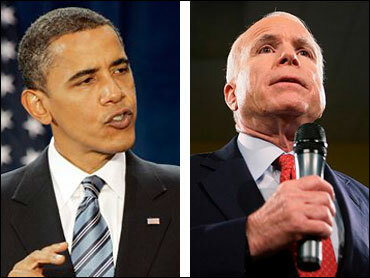 "History shows us that if you raise people's taxes in tough economic times that makes problems worse," McCain said. The Arizona senator also called on Congress to move quickly and work with the Bush administration to restore stability to the troubled financial sector. But he said the goal of any action must be to allow homeowners to stay in their homes and prevent Wall Street executives from profiting from a taxpayer bailout. Obama also has focused tightly on the economy in recent days, and he has urged Democrats and Republicans to join forces to approve a bailout of the troubled financial industry that not only saves the industry but protects taxpayers. "We are here because an ethic of irresponsibility has swept through our government, leaving politicians with the belief they can waste billions and billions of your money on no-bid contracts for friends and contributors, slip pork projects into bills during the dead of night and spend billions on corporate tax breaks we can't afford and old programs we don't need," said Obama. He linked the turmoil that's rocked Wall Street to federal spending he said has soared out of control, laying the blame at the feet of Republican policies he argued that McCain is certain to continue. President Bush ran for office on a platform of efficiency in government, Obama said, noting that Bush instead has presided over a mushrooming federal budget and deficits. Under Bush, spending on contractors has more than doubled, from $203 billion in 2000 to $412 billion in 2006. "We cannot give a blank check to Washington with no oversight and accountability, when no oversight and accountability is what got us into this mess in the first place," said Obama. He warned that even as the government moves to bail out the financial sector there are signs that special interests are looking to profit. Obama said he's spent the last two years running for president on a promise of change, and he mocked McCain's argument he can bring change to Washington. "This whole change thing must be catching on," said Obama. "I've noticed that John McCain is trying to steal my signs. He trying to make up for 26 years in 26 hours. Who do you think has been running the government for the last eight years?" He accused McCain of "an election-year conversion" that's brought change into his rhetoric. "After 26 years of being part of this Washington culture, all that he has changed is his slogan for the fall campaign," said Obama. Obama warned that the election is hard fought because special interests are fighting hard to keep their place at the table. "It won't be easy, the kind of change we're looking for is never easy," said Obama. "What we are up against is a very powerful entrenched status quo in Washington who will say anything and do anything and fight with everything they've got to keep things just the way they are." Obama spoke to 6,000 people in an arena in a state that trends Democratic, and where Obama badly needs a win. McCain's comments came at a raucous meeting with an Irish-American group in Scranton, a working-class city in northeastern Pennsylvania that has been a hub of campaign activity and rhetoric throughout the year. Democratic vice presidential contender Joe Biden hails from Scranton and on the campaign trail often speaks of his blue-collar roots here. Before last spring's Pennsylvania primary, Democratic Sen. Hillary Rodham Clinton also laid claim to the town, where her father grew up and is buried. Clinton defeated Obama by 10 percentage points, in part due to her strong showing among white working-class voters in the state. At the rally, McCain was introduced by the state's Republican senator, Arlen Specter, who praised Obama as an "able fellow" who nonetheless lacked McCain's years of experience in Washington. McCain also took a few friendly questions from the audience, including one from a woman who asked why news organizations had committed so many investigative reporters to look into the background of Alaska Gov. Sarah Palin, McCain's running mate. "Shame on you, shame on you," the woman shouted to applause, while McCain looked on approvingly. "That is a great question," McCain said. "One thing I want to assure you of is that Governor Palin - she can take it." The anti-media rant continued on a conference call later with McCain campaign manager Rick Davis and Steve Schmidt, who manages day-to-day operations and strategy. Schmidt criticized what he called a "compliant media" that he argued hadn't sufficiently investigated Obama's background and campaign claims, and singled out The New York Times, which he called a "pro-Obama advocacy organization.